Naná Vasconcelos brought spirit and soul into everything he touched. He was close to Nature, close with animals, close with the people around him, close to the gods. As a result, he was close to himself. He listened carefully to his inner voice and had the courage to let that voice speak bravely. 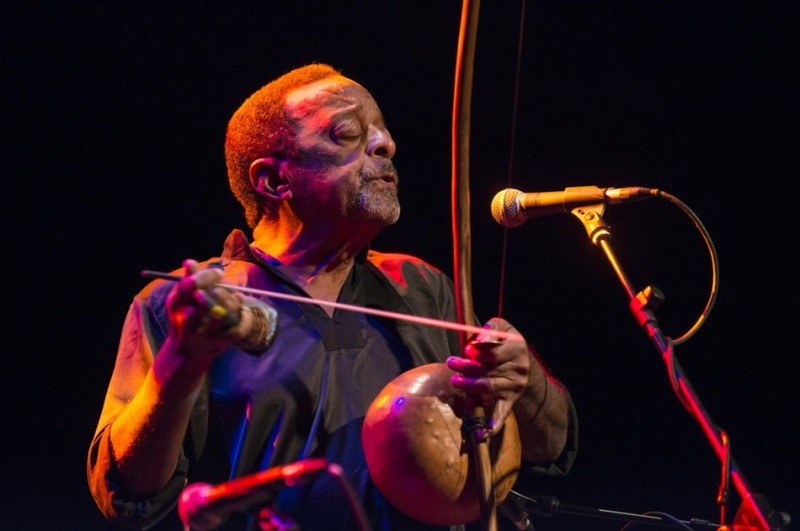 His unique approach to the berimbau channeled his profound spirituality and everyone who heard him play felt it. His music came into my life in an unexpected and powerful way listening to his recordings in 1999. His passionate berimbau performances on his solo album Saudades (1980) struck a note deeply in my soul and I have been playing the berimbau and following its voice ever since. 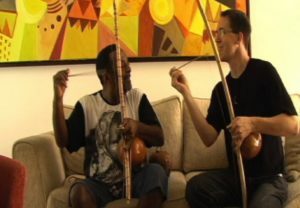 In a 2007 interview in his home in Recife, Naná told me, “the berimbau is very spiritual. The sound of the berimbau comes from inside…the sound of the berimbau takes you to a calm place where you ban be quiet inside yourself. You can listen to your inner silence. Something of nature is in that sound.” Naná thought about the soul of the berimbau and worked with it for countless hours, until one day it spoke to him directly. From that point on, his voice became inseparable from the berimbau. He and the berimbau became one. Mestre Naná’s example and spirit will live on in the work of Arcomusical. Our mission is to spread the joy of the berimbau musical bow. Arcomusical would not exist without the seeds of inspiration that Naná planted and gave to the world. Naná and Greg playing berimbau in Naná’s home. Recife, 2007. Mestre Domingo, cadê seu chapeu? O meu chapeu ‘tá no alto do ceu! O meu chapeu é o alto do ceu! Tickets are now on sale for our show with Contemporaneous in NYC. We are so pumped for this collaboration! Get ready people, because next month we're celebrating our 10 year anniversary with some stellar programming comprised of old and new friends! Tix onsale now for @kurtbraunohler with guest DJ @realtedleo, @butterboycomedy featuring special guests, @oneida_official, @califone_timrutili, @econtemp and @projetoarcomusical, Dig Deeper presents @3masqueraders, and more to be announced soon! Arcomusical is honored to have been featured in this 21CM.org video and article meant to showcase the incredible work of Four/Ten Media. In conjunction with our new National Sawdust Tracks album release, "Spinning in the Wheel," Arcomusical created eight videos with Evan Monroe Chapman and Kevin Eikenberg. This video summarizes the intention behind our music and how Four/Ten helped us to realize our vision and release it into the world. Special thanks to Elizabeth Nonemaker and Mark Rabideau for commissioning this video! Arcomusical had the distinct honor of premiering Elliot Cooper Cole's "Roda Grande" this past Sunday with the ASU Symphony Orchestra and conductor Jeffery Meyer, with Elliot Cooper Cole present at the performance. This is a concerto version of Cole's "Roda," a work made possible through the generosity of Chamber Music America.